I should move to Seattle! I love to write when it is raining outside. A freshly steeped cup of jasmine tea next to me, a candle burning brightly, and the pitter patter of the rain on the windows and roof stir up my creative muse. My words flow and time becomes irrelevant. 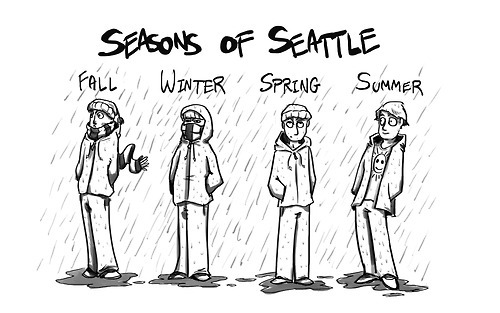 Well, the issue for me is I don’t live in Seattle, I live in Colorado where we average 300 days of sunshine a year. The blue sky, fresh air, and mountains frequently try to lure me away from the computer to come out and play. At a recent gathering of writers we discussed how to stay motivated to write during the summer. It is clearly an issue for many (as J.C. also discussed in her most recent post). Some ideas were thrown around, such as take your writing outside, spend more time reading, allow yourself extra time to be outdoors and be more flexible with your writing time. Then someone said. "It shouldn’t matter. It shouldn’t matter what the weather is like or what time of year it is. If you are committed to your writing, then you will stick with your routine and write. You will make the time to crank out those words and prioritize your writing." It was hard to argue with that logic, and no one did. The truth is, this is the advice given by many famous authors like Stephen King, John Grisham, and Janet Evanovich: if you want to be a writer then you need to write every day. So maybe what we need to do as writers is take the inscription that hangs in a New York City post office, “Neither snow nor rain nor heat nor gloom of night stays these couriers from the swift completion of their appointed rounds,” adapt it for us, and hang it by our workspace. It can't hurt. How much time do you devote to your writing in the summer months and how do you stay committed to that time? Hi Kerrie. On the other hand, sometimes we need or want to "not write." And when that happens, as long as "not writing" is a conscious choice, then we need to own that decision and throw off the guilt. I'm a binge writer, so that writing every day business doesn't work for me. I felt guilty about that for years because I felt I "should" write every day or I wasn't a real writer. The older I get, the more I realize how valuable time is, and that writing time is no more important than sleep time, or kid time, or even walking the dog time. Every person has to find his or her own life balance and writing style. writing every day won't work for everyone.